Love super-flaky pie crust? The secret's in the science! When you add vinegar to your dough the acid works with the fat in your recipe to keep gluten strands from getting long. Long gluten strands yield a tough, chewy crust. But a bit of vinegar gives you a more tender crust with the flaky texture everyone loves. In a food processor, combine the flour, sugar and salt; cover and pulse to bend. Add the butter, soda and vinegar; cover and pulse until mixture resembles coarse crumbs. While processing, gradually add water just until moist crumbs form. Shape into a disk; wrap in plastic wrap and refrigerate for 30 minutes or until easy to handle. Roll out pastry to fit a temp-tations® 9 inch pie plate. Trim pastry to 1/2 in. beyond edge of plate; flute edges. In a large bowl, whisk the eggs, sweet potatoes, milk, sugar, brown sugar, butter, orange peel, cinnamon, vanilla, salt, cloves and allspice until blended. Pour filling into crust. Bake at 400 degrees for 30 minutes. Meanwhile, in a food processor, combine the cookies, butter, sugar and flour. Cover and pulse until coarse crumbs form; sprinkle over pie. Cover edges of pastry loosely with foil. Bake for 15-20 minutes longer or until a knife inserted near the center comes out clean. Cool on a wire rack. In a small bowl, beat cream until it begins to thicken. Add sugar and maple syrup; beat until stiff peaks form. 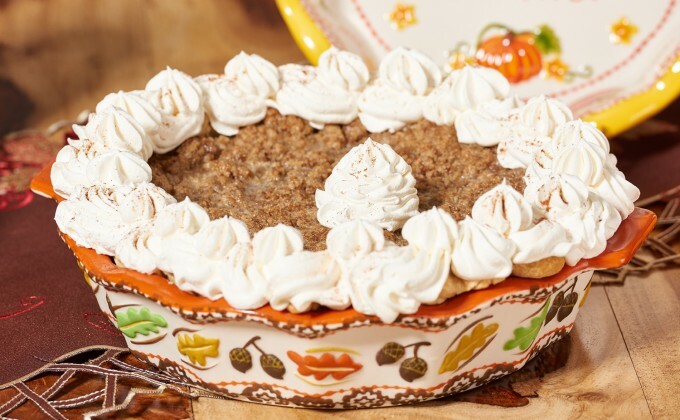 Serve topping with pie. Refrigerate leftovers.